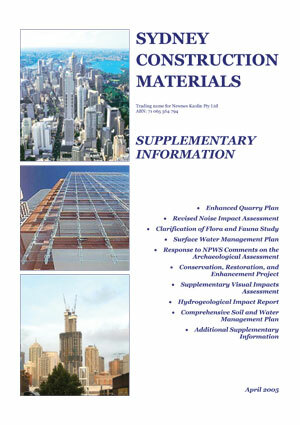 Following feedback received after the submission of its EIS in July 2003, Sydney Construction Materials reviewed its project design and came up with several enhancements. These enhancements were submitted to the then Department of Infrastructure, Planning and Natural Resources (DIPNR) on 19th April 2005. Where there exists a conflict between the EIS and the more recent Supplementary Information, the Supplementary Information takes precedence. Use the links below to view the Supplementary Information. Alternatively, you can click here to download the entire Supplementary Information submission in one file (21,835 kB pdf).